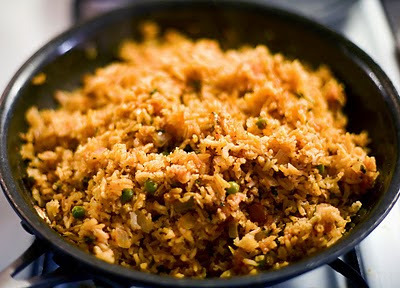 There were foods that were staples in our family home growing up: the makings for rice, beans, tortillas, and there were always eggs, bread, peanut butter, milk and butter too. So no matter how strapped my parents were (they had five kids after all and it wasn't until I was in junior high that mom went back to work), we had complex carbs and protein to get us through any lean weeks. There are others on the list as well but just with these basics, I know I can always whip something up in a pinch. That's were this next recipe comes in. I'm still enjoying the albondigas that I made on Friday. But come Sunday night, I was wanting to change it up a bit and add a little something extra to it. 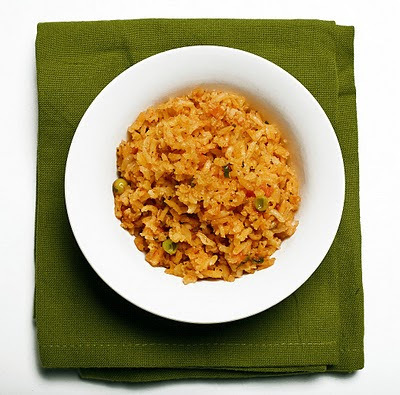 So I looked around my pantry and decided to make Spanish rice to top the soup with. Something I liked to do when I was growing up. 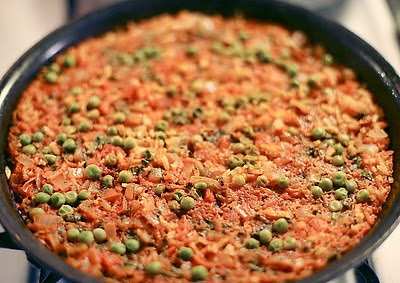 The great thing about having Spanish rice all ready made and on hand is that it's a side dish that goes with almost anything. And it's a nice alternative to plain white rice. 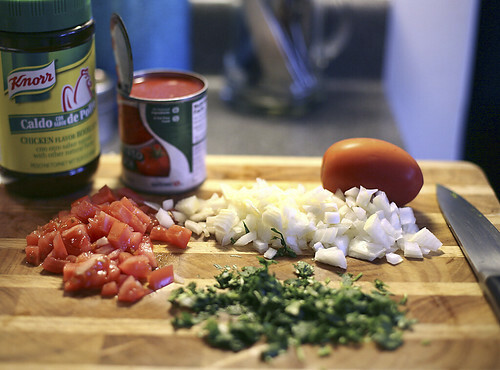 First, chop up the veggies: 1 roma tomato, half an onion and about 1 tablespoon of cilantro. Heat up your pan on medium heat setting. 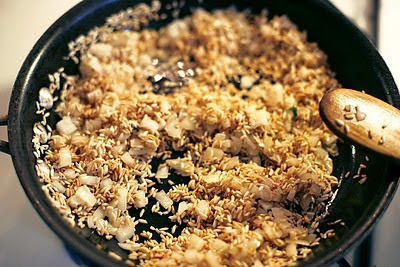 With a little vegetable oil in the pan, add the rice and cook until it turns opaque and starts to brown (golden NOT dark). The little rice kernels will actually start to pop like corn does! 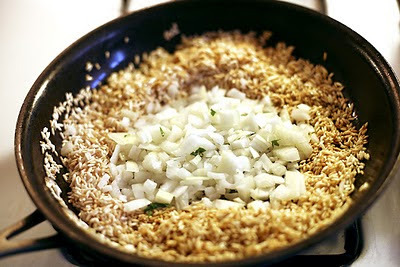 Make a little well in the center and add the onions. Stir and cook until the onions get soft. Don't walk away. You don't want the rice to get too dark or to burn. Cook down for 1 minute stirring the entire time. Add the water, cilantro and the bouillon. 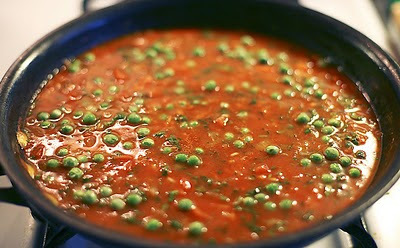 Stir well to incorporate the bouillon then add the peas. Reduce the heat to low, cover and set your timer for 15 minutes. RESIST THE URGE TO LIFT THE LID AND CHECK ON YOUR RICE. When the timer goes off, turn the heat off. Leave pan on the burner and reset your timer for 10 minutes. DO NOT UNCOVER. This is where so many folks turn what could have been perfect rice into something not quite edible. 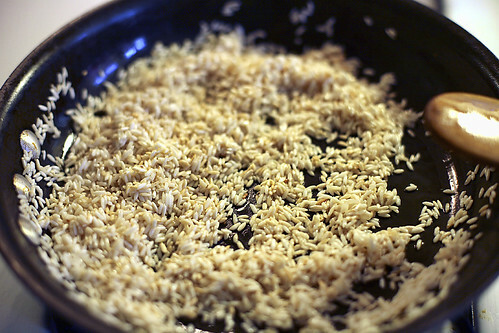 Using a fork, fluff up the rice and behold, nice fluffy, non-sticky, perfectly plump rice. Yum! Warm up a pan, add vegetable oil. Once your oil is hot, add rice. Stir constantly. Rice will become opaque, then will start to pop and turn slightly golden. Make a well in the center, add onions. Stir until onions become soft. 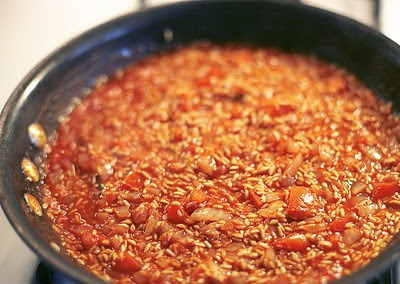 Add tomatoes, cook for 1 minute stirring. 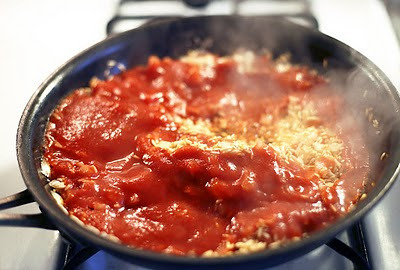 Add tomato sauce, stir and cook down for 1 minute. Add water, cilantro, bouillon. Stir well to incorporate. Reduce heat to low and cover. Cook on low heat for 15 min. Do not lift lid during cooking. At the end of the 15 minutes, do not lift lid, turn off flame and let stand for 10 minutes. At the end of 10 minutes, remove lid and fluff with a fork. Serve and enjoy! I used a whole 8oz can of tomato sauce because I like the richness of it. Mom and dad don't. 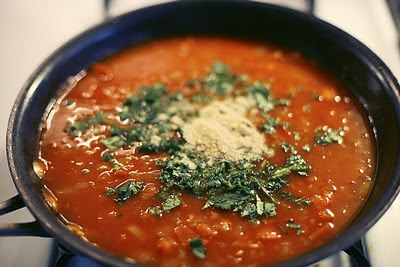 You can reduce the sauce to 1/3 cp and up the water to 1 2/3 cp to keep the wet ratio the same. 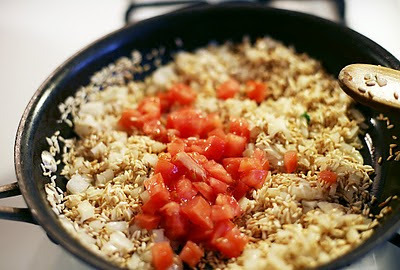 use the left over rice in a breakfast burrito the next day with a little egg, cheese, onion. Yum! Your turn: What staples do you try to keep from running out of?